What strikes me most about Jennifer is her passion and focus. We worked together on a project for my client where she took extra care to understand the need, create a framework that would work in the time we had, and build trust and a comfort level with the group. I found they were relaxed and communicated openly with her. I then engaged her to coach individuals in India servicing US clients. I do believe her experience of standing in the gap between the two cultures will give them an edge. This advantage has already benefited the clients in achieving real results and positive change in the areas of engaging Americans in more culturally appropriate ways when managing various situations from everyday small talk, taking initiative in conversations, and an ability to address difficult discussions in a non-defensive, yet friendly way. 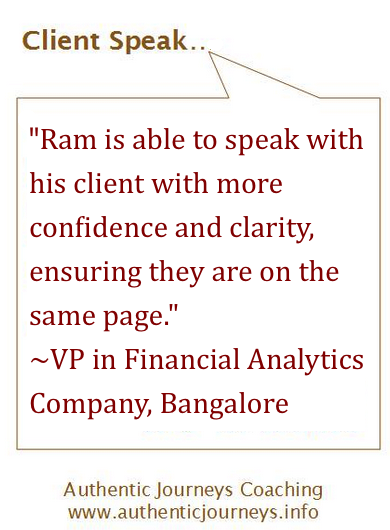 VP feedback,"Ram has shown marked improvement in his communication skills with his client over the period. Now his sentences are short and able to communicate well to the client, basically ensuring that the client is also on the same page. 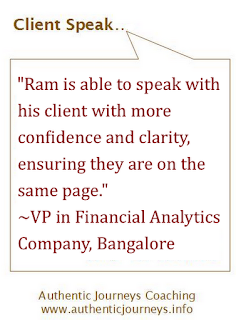 He is all the more confident now than before when speaking to the client." Get in touch with Jennifer to start working with your team today!